Christopher Brookins is the founder of Pugilist Ventures, a quantitative crypto fund founded out of Carnegie Mellon. In 2018, the ethereum network has been hobbled by delayed protocol upgrades, ICO boom hangover and the overall crypto winter. However, several fundamental indicators, which, in theory, should be indicative of positive price momentum, are pointing to undervaluation. For example, ethereum’s network value is down ~93 percent from its peak, whereas gas consumption is down 7 percent, transaction count is down 52 percent and active addresses are down ~73 percent. Interestingly, network transaction volume is down ~99.50 percent from its peak, which offers a bit of foreshadowing. After analyzing a few fundamental metrics and creating some of my own, a simple correlation matrix between the aforementioned indicators to (change) in price of ETH is quite revealing. As can be seen, there is a dichotomy between theory and practice of what fundamental demand indicators should be driving price. Currently, per the correlation matrix, it appears, quality (average and median transaction value) rather than quantity (active addresses, transaction count, gas, and more) is driving ether price movements, which flies in the face of Metcalfe’s’ Law. Specifically, the metrics measuring the ratio or balance between quality to quantity, e.g. 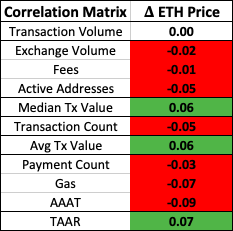 average transaction value, median transaction value, and transaction volume to active addresses (TAAR); all have positive correlations with price of ETH. Thus, it appears that an increase in network transaction volume in relation to quantity metrics, preferably for fundamental utilization of dapps solving real-world problems like decentralized finance, will be the key to finding a stable price bottom; if these correlations hold. TAAR is a metric first introduced here, which highlights its usage as an equilibrium gauge for bitcoin by measuring the change between quality versus quantity fundamentals. However, unlike TAAR for BTC, it appears ethereum’s network dynamics do not match that of bitcoin, which should not be surprising given they are two completely different digital assets, solving two completely different problems. See TAAR and price logarithmic chart below. 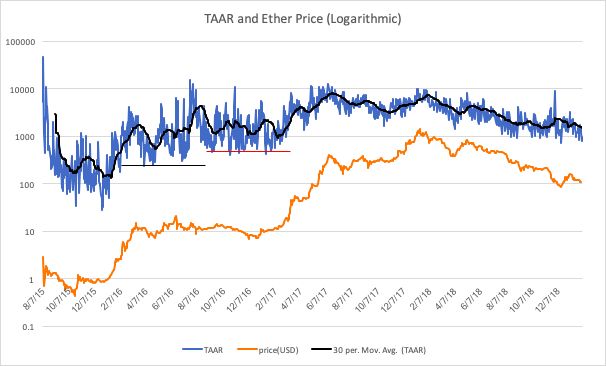 But, instead of TAAR acting as an equilibrium gauge for ETH, it might better serve us as a directional price gauge instead. Meaning, that if the 1000 level of TAAR holds, then ETH is likely to have bottomed out around $100. However, if not, and TAAR retests lower levels of 500 (red line), 300 (black line), or even 100, further price depreciation for ETH is certain. AAAT visualizes the “tug of war” between quantity and quality indicators within the ethereum network. Again, quantity is associated with negative correlation to price. 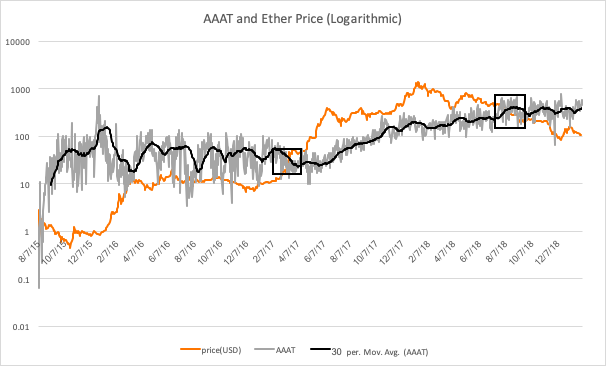 As seen above, the correlation between price of ETH and AAAT is -0.09, meaning that when active addresses (quantity) grow faster than average transaction value (quality), prices react negatively. Furthermore, visualizing the metric versus price, on a logarithmic chart, we can see that price has historically stayed beneath AAAT and has acted as resistance. But, when price does cross (similar to a golden cross) above AAAT, that means good things for price growth (see first black box). Unfortunately, price recently fell beneath AAAT back in December 2018 (second black box), which may signal further price weakness ahead for ETH, if nothing changes in the quality metrics. However, one positive note might be the dynamic between AAAT and TAAR. 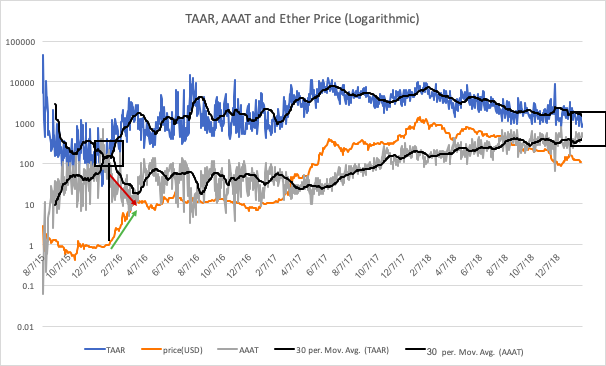 As seen via the logarithmic charts below, TAAR and AAAT have the ability to act as a counterbalance within the fundamental price movements. For example, in late-December 2015, a declining TAAR and increasing AAAT met (on daily and 30 day averages), and bounced off one another (first black box), which saw AAAT move lower (red arrow) and TAAR move higher. That “collision” sparked a dramatic increase in price of ETH in Q1 2016 (green arrow) and ultimately laid the foundation for the remarkable two year bull market (2016-17) ether experienced. At time of writing, TAAR is decreasing and AAAT increasing, with the divergence between the two becoming increasingly smaller (second black box). If history repeats itself, which is tepid given the sample size limitations, another “collision” could be forming, which could mean a price bottom, and probable reignition of a bull cycle for ETH. If history repeats itself even more closely, this dynamic will unfold in late Q4 of 2019, which should set the stage for a similar surge in ETH prices in Q1 2020, as seen prior in Q1 2016. The principal assumptions of what drives price and network growth for digital asset ecosystems are incorrect. The limited amount of data we have to measure these dynamics are not sufficient to draw accurate hypotheses or conclusions. Something beyond the fundamentals is driving the price of ETH, which might be sentiment or liquidity (distressed sales of ICO proceeds). Personally, I hypothesize that it is a mix of all three. However, once a bottom is found, and assuming nothing extremely negative has occurred to damage the overall viability narrative, price is likely to recover more rapidly than other digital assets in the Top 5. Principally, due to the potency of sentiment swinging back positive from overly depressed price levels without systemic technological issues, coupled with pent up buying demand, i.e. rubberband effect. Disclaimer: this article is for educational purposes only and should not be considered investment or trading advice.